I love sprinkles, which is probably most definitely why I love funfetti. I don’t remember ever buying the box mix myself but I had it at parties and something about colorful sprinkles hidden in a cake batter is just so fun. 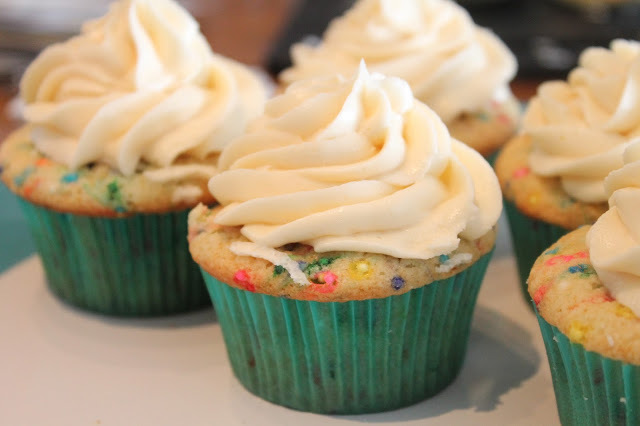 So, when I found out that my favorite blog ever, How Sweet It Is, had come up with her own homemade funfetti cupcake recipe, I knew I would have to make them. And I did. I’ve actually made these a few times, with different frostings. 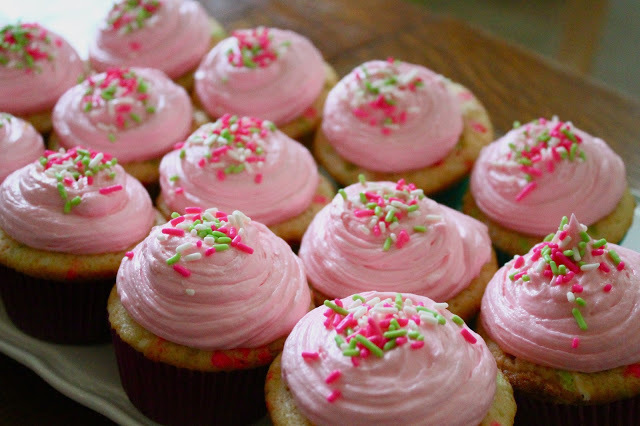 What’s really nice is the recipe can be made quickly, so it’s a good cupcake to bring to a party and share. I had leftover salted caramel buttercream from my dark chocolate cake with marshmallow filling, so Ryan and I whipped up a batch of these cupcakes and added the salted caramel frosting – delicious. I’ve also made them with a simple chocolate buttercream. 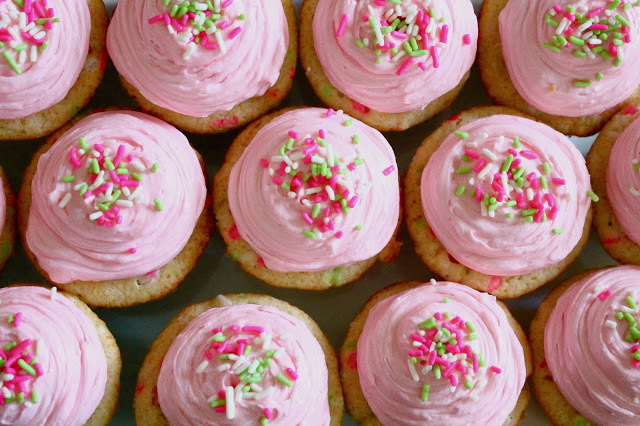 They’re a great vessel for whatever kind of frosting you want. I decided on a simple vanilla frosting because one of the girls I was making these specifically for doesn’t like chocolate or most sweets (I know). Anyway, so I love sprinkles. You know who else loves sprinkles? My friends Alicia and Molly. Their birthdays were only a few days apart, and I knew I wanted to bake something for them. Since they both will literally eat sprinkles straight out of the jar, funfetti was the obvious choice. I met Alicia in March, just about a month after I moved to LA. I only had about 1 or 2 friends that lived out here, and I didn’t know where to find friends. I had a meeting at a commercial agency (that I’m currently signed with) and since I am almost always early for meetings and auditions to avoid traffic, I was in the lobby with some time to kill. I start talking to the assistant (Alicia) and after talking for awhile, we realize that she lived in Culver City and that I was just about to move into an apartment only 2 blocks away. She wrote down her cellphone number and told me if I needed any help with anything or needed any friends, to let her know. Pretty sure I texted her the next day. So Alicia and I start hanging out, and then after a week or two, I finally got to meet her roommate Molly. And honestly? The rest is history. I found two great friends in a city that is notorious for being lonely and spread out and difficult to meet people. I’m pretty sure I wouldn’t have adjusted as quickly (though nowhere near done adjusting to LA) and I’m pretty sure I would have had a much more difficult time without them. So, when their birthdays came around, I had to bake something for them. And in full disclosure, I totally went to Yogurtland and only bought sprinkles because sprinkles at Ralphs were $3-4 for a tiny container and I was able to get a lot of pretty pink, green, and white sprinkles for $1.50. Yay resourcefulness! In a small mixing bowl, whisk together flour and baking powder. Set aside. In a large mixing bowl, cream together butter and sugar until light and fluffy. Add in eggs and the vanilla. Beat until combined. Add half of the dry ingredients to the large mixing bowl, beating on medium until just combined. Add in the milk and mix until incorporated. Add remaining dry ingredients and mix until blended. Using a spatula, gently fold in the sprinkles. Line a cupcake tin with liners and then fill each well about 2/3 of the way full. 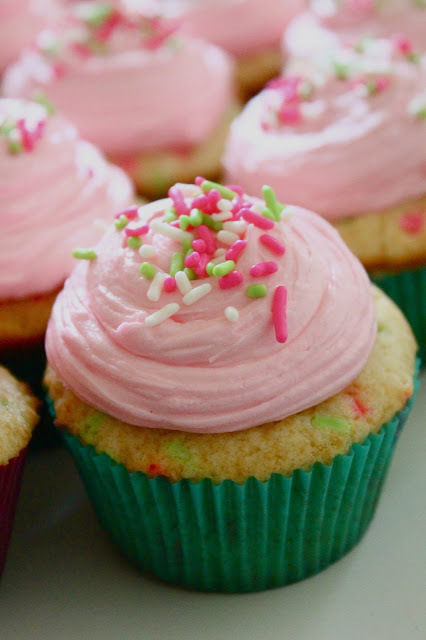 Bake cupcakes 16-20 minutes or until a toothpick comes out clean. Let cool for 5 minutes in the pans and then transfer cupcakes to a wire cooling rack and let cool completely. 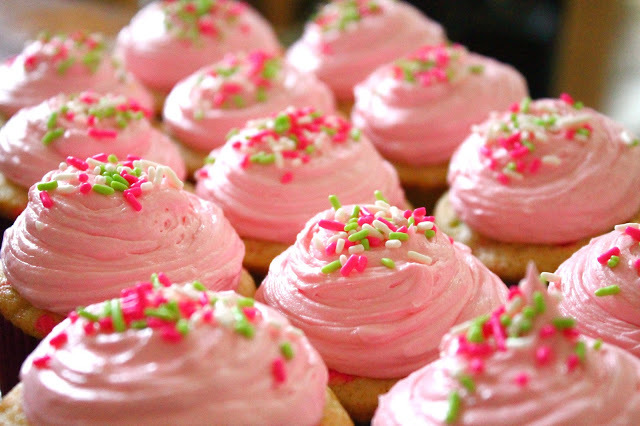 Frost cupcakes . In the bowl of a stand mixer, cream softened butter until smooth and creamy. Add in powdered sugar 1/2 cup at a time on low speed. Add in vanilla and beat on medium for about 2 minutes, scraping down the bowl as needed. Add in a drop of gel coloring and use a spatula to fold the color into the icing until you have the shade you desire. 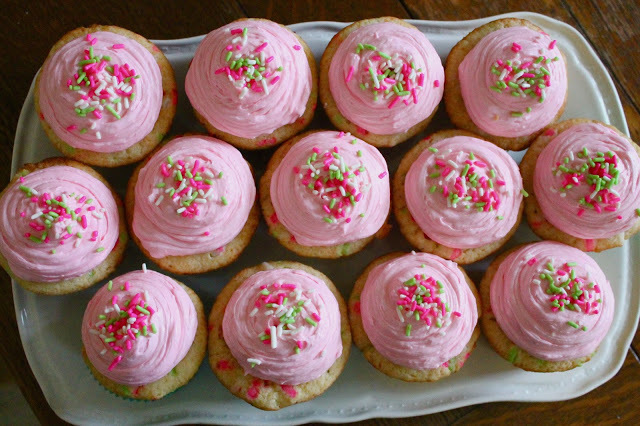 Frost cupcakes and top with more sprinkles. Note: If frosting is too thin, add some more powdered sugar. If it’s too thick, add milk or heavy cream 1 teaspoon at a time. P.S. 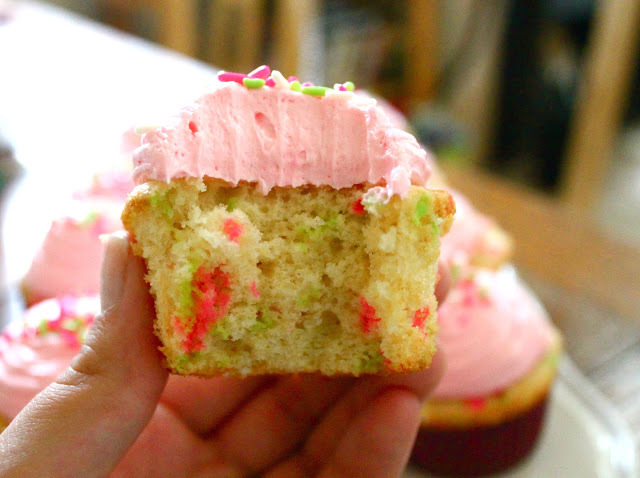 Here are funfetti cupcakes with salted caramel buttercream. Try out this pairing next!